Philips has a trusted line of men’s and women’s personal grooming products. They have something for everyone, from low prices to premium prices. Many women want a bikini trimmer so they look their best for summers at the beach or pool. 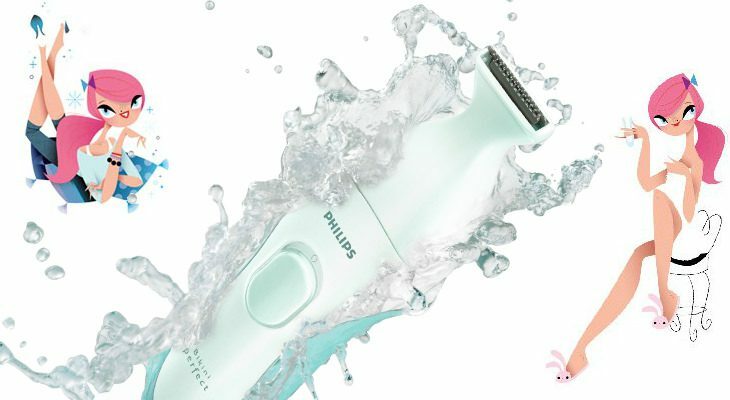 The Philips HP6378 Bikini Perfect Deluxe Trimmer is not only cordless and rechargeable, but it can also be used wet or dry. 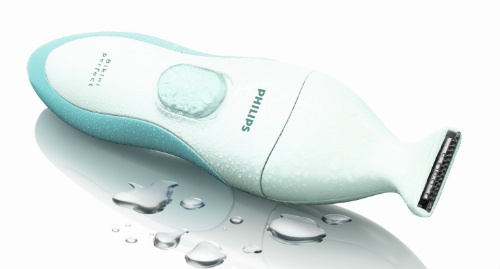 Philips has turned a weekly chore into a fun and fabulous bikini trimmer. 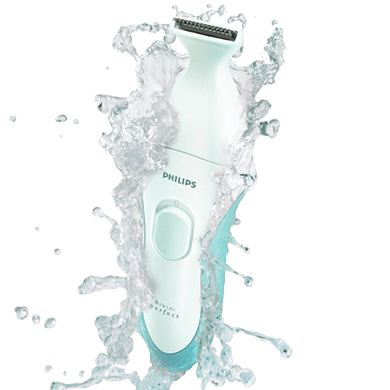 Women who get minimal leg hair growth may wish to toss out their regular women’s shaver, but for most, they’ll buy the Philips trimmer as a second personal grooming product. 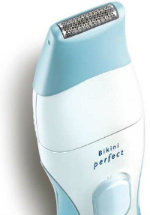 The Philips HP6378 Bikini Perfect Deluxe Trimmer comes in a sleek white and aqua blue plastic body. It has a narrow trimming head at the top, and is curved at the bottom, making it easier to hold in the hands. There is an oval on/off button that slides up or down. The Philips logo is located about halfway down the front. Not all cordless bikini trimmers can be used wet, so the Philips HP6378 Bikini Perfect Deluxe Trimmer offers great convenience while showering or sitting in the bathtub. There are a total of six different super precise attachments, so you can have a flawless bikini line. There is also a clear plastic comb to help make shaving more comfortable in your nether regions. You have the choice to shave, trim, or shape your hair. This can be your best friend for bikini region grooming. You can use these six attachments from head to toe. The precision trimmer will let you groom your bikini line in comfort. This precision comb can be attached, or detached. If you’re trimming your bikini region, you have the choice of five different length settings. You can trim your eyebrows with the eyebrow comb. It will trim both of your eyebrows to a uniform length. The micro trimmer attachment will also help to shave your eyebrows, or do as little as remove one single hair. 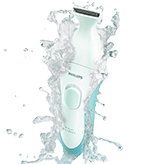 The micro shaver attachment will shave from under your nose to your bikini line and to your toes, or anywhere that you no longer want to see hair. 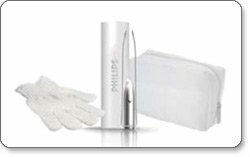 The micro shaver foil has been made with hypoallergenic stainless steel to avoid allergic reactions. You’ll get a nice super close shave that is also gentle and safe. There is also an epilator, which will pull hair out by the roots. This allows for stubble-free skin for up to four weeks. This is a great option, as women will no longer have to buy a third personal grooming product for the bathroom in this three-in-one Philips bikini trimmer. The Philips HP6378 Bikini Perfect Deluxe Trimmer is cordless and rechargeable. One full charge will give you about sixty minutes of running time. It will take ten hours to fully charge up your Philips HP6378 trimmer. There are some nice beauty bonuses with your Philips HP6378 Bikini Perfect Deluxe Trimmer kit. You’ll also get illuminating tweezers so you can tweeze your eyebrows to perfection. There is a light on it that will help you to see the tiny hairs need to be removed. There is also an exfoliation glove which will be perfect for softening hardened elbows, knees, or heels. There is also a travel bag, so you can place your trimmer and your attachments all conveniently in one spot, without worrying about losing them. 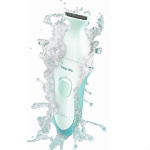 The Philips HP6378 Bikini Perfect Deluxe Trimmer kit costs $45, which is about the right price for a bikini shaver that can also be used in the shower, and doesn’t require the use of batteries. It’s simple to maintain your Philips HP6378. Simply wash it out after using. You do not need to use any engine oil. In the box you’ll receive one Philips HP6378 Bikini Perfect Deluxe Trimmer, six grooming attachments, a charger cord/plug, a travel bag, an exfoliation glove, and illuminating tweezers. There is a 45 day money back guarantee if you’re purchasing off Amazon, and a full two year warranty. The trimmer weighs four ounces, and measures 2” x 1.5” x 7.2 inches. The entire kit weights 1.4 pounds. The reviews are pretty good for the Philips HP6378 Trimmer, with about 3.9 out of 5 stars. It can be difficult choosing which bikini trimmer to buy. Most women will be happy paying around $50 for one. Most bikini trimmers are cordless today, but some have batteries and some are rechargeable. The rechargeable option is best, as you don’t have to worry about buying batteries or having an available supply in your bathroom. Also, tossing batteries into the landfill is frowned upon nowadays. There is also the time and effort of having to replace them. Rechargeable is really your best bet. 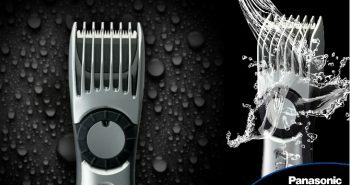 Your other choice lies in whether to buy one that can be used wet or dry. Most women know that shaving with water, and lotions, foams, or gels, makes shaving a more pleasant experience, and minimizes after-shaving irritation. 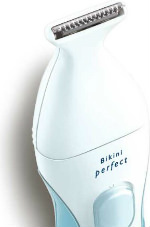 Most women will appreciate the wet/dry feature of the Philips HP6378 Bikini Perfect Deluxe Trimmer. If you’re looking for a safe bikini trimmer that won’t nick or cut, but is also rechargeable and can be used wet or dry, you’ll like how well the Philips HP6378 Bikini Perfect Deluxe Trimmer performs.